Before you invest time and money in your invention, make sure you obtain a thorough patent search first. The third edition of David Hitchcock’s book, Patent Searching Made Easy, is a guide to help you perform preliminary patent and non-patent prior art searches using free online resources. The United States Patent & Trademark Office (USPTO) now regularly requires a high quality prior art search with a patent application. Therefore, after you read this book, you may also decide to use a fee-based online search system, hire a professional patent searcher, or at least consult with a registered patent agent or attorney to review your search findings. Nevertheless, this book will get you started in the right direction. 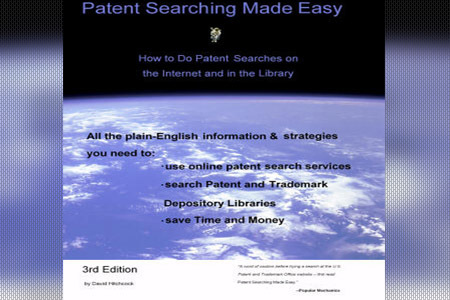 The book provides instructions and strategies for basic and advanced searching of U.S. patents using the USPTO’s free online patent search system found at www.uspto.gov/patft/index.html. The book covers Boolean keyword search techniques; searching by class-subclass and patent number; viewing patent images; and using the USPTO Manual of Patent Classification and Index to U.S. Patent Classification to enhance a patent search. The USPTO frequently makes changes to its patent classification system in order to keep up with changes in technology, so knowing more about how to use the classification system is a good thing. Clear terminology and inclusion of images from patent search web pages make the instructions easy to follow. The author also provides templates to aid in developing an effective search strategy. Many of the subjects covered here in this paragraph are also covered in the second edition. Q: What’s new in this edition? A: Instructions for USPTO WEST & EAST and EPO search systems. The third edition includes instructions on how to search the European Patent Office’s (EPO) free patent search system, located at http://ep.espacenet.com. It also explains the workings of the following search tools found at some Patent & Trademark Depository Libraries (PTDL): Web-Based Examiner Search Tool (WEST), Examiner Automated Search Tool (EAST), and Classification and Search Support Information System (CASSIS). A: Additional non-patent prior art searching resources. The new edition includes instructions on how to search non-patent prior art using the online search engine Google and the Thomas Register web site, www.thomasnet.com, along with other web and non-web based tools. A: Out-of-date resources have been updated or removed. Gone are the days of the free online IBM Patent Search Site or the U.S. Patent & Trademark Office’s APS search system available at PTDLs. The third edition has therefore eliminated these and other out-of-date resources mentioned in the second edition. A: Fee-based patent search resources are not included. While the second edition lists several fee-based commercial search systems in chapter eight, the third edition, unfortunately, does not include any. The use of commercial search systems should not be discounted during your search, as many commercial search systems have unique investigative capabilities not found in free resources. Patent examiners at the USPTO and other patent offices use commercial search systems while performing their patent and non-patent prior art searches during the patent application examination process. Examiners often use specialized systems such as STN® (www.cas.org/stn.html) to do chemical structure and chemical function searching. Gene-IT® (www.gene-it.com), another specialized search system, may be very helpful if your invention concerns a genetic sequence. Patent practitioners and search professionals also use many of these same fee-based systems. Visit Fee Based Databases for a list of commercial databases. Some of the above systems may save you time in the search process by allowing you to simultaneously search multiple patent authorities (U.S. Patents, PCT Patents, and EPO Patents searched at one time). Many of these systems, such as www.delphion.com, have affordable weekly or monthly subscription rates. Other systems are a bit more expensive and may charge by the minute and by the number of records examined. However, these more costly systems have free database sections where you can practice creating your own search strategy before paying for the real database search. Not all free or fee-based patent search systems are created equal. So be sure to research the extent and quality of the databases these systems use. Q: How can I enhance the use of this book? A: Use other free resources found online. The free patent search website www.freepatentsonline.com includes many features that are superior to the USPTO online search system, and allows you to conduct searches in a manner similar to those used by the USPTO online search system. One feature is the ability to search patents and published applications at the same time. The USPTO online search system allows only separate searching of patents and patent applications, doubling the workload. Another great feature of FreePatentsOnline is that their TIFF and Adobe PDF images of patents and published applications are contained in one connected document. The USPTO online search system, on the other hand, includes only TIFF images that are broken down page-by-page, making it more cumbersome to print or view these documents. FreePatentsOnline is currently adding EPO patents and published applications, while also planning to add patents and published applications of the PCT and other patent authorities. In addition they plan to add latent semantic indexing. FreePatentsOnline plans to keep their search system free while building their business around value-added services such as patent analytics. So, with the help of the search instructions in the book and a little work learning the nuances of this search site, you’ll have another free site to use. A: Request help from a USPTO patent examiner. One step an inventor can take is to consult with a USPTO patent examiner via phone to request help with a field of search for a patent novelty search. A field of search is what patent classes and subclasses the examiner recommends searching based on the description of your invention. Locate fairly recent patents in your invention’s area of technology. Contact the examiner who reviewed the relevant patents; you can find his or her phone number at www.uspto.gov/web/menu/emploc.htm. When you call or leave a voicemail, introduce yourself as an independent inventor needing help with a field of search. Be sure to thank the examiner for the time he or she spends helping you. This edition of Patent Searching Made Easy will help many inventors conduct preliminary searches designed to compare their ideas with inventions found in existing patents and published patent applications. Read more reviews or purchase the book at www.lulu.com, www.amazon.com, and other online bookstores. The www.amazon.com site includes excerpts of the second edition. Click here for a review of Patent Searching: Tools & Techniques. Glen Kotapish is president of the Independent Inventors Network of the Capital Area (INCA), www.dcinventors.org. He is founder of www.PlanetPatent.com, Professional Patent Search Services. Glen is also a member of the Patent Information Users Group (PIUG), www.piug.org, and the National Association of Patent Practitioners (NAPP), www.napp.org. He can be contacted by e-mail at search@planetpatent.com or by phone at 1-866-U-INVENT.